It is amazing how such a tiny pest can cause so many problems for Arden Hills, property owners. An Ant Colony can contain up to 500,000 ants! There are as many as 700 ant species found across the United States, with 25 species that may infest homes. They are considered to be the number one nuisance pest in the country. The Ant Extermination Experts at Eco Tech provide professional eradication with lasting results for both Residential and Commercial properties. Our technicians are trained to identify the species of ants on your property and use techniques that are most effective for that particular ant species. Most Ant Species are quite small but they are still capable of causing big problems around your home. If left unchecked, ant problems can multiply as quickly as the size of the colony. They are able to enter through the smallest of openings and signal tens, hundreds or thousands of ants to follow. Carpenter Ants can cause significant damage to woodwork by building nests and tunneling in wood around windows, inside walls and attics. Once inside your home, ants will give off pheromones that signal other ants to follow and set up nests. Nests can be difficult to find and eliminate. Using the wrong Ant Extermination Treatment can result in the colony splitting and your ant problem worsening. Ants are attracted to food, particularly sweets. They crawl across countertops looking for food and water. Ants carry bacteria that can contaminate your food. Some ant species can bite or have a painful sting. Over the counter Ant Poisons are hazardous for children and pets and are less effective than those used by Professional Ant Exterminators. Ants can create large nests in lawns, tree stumps, patios, driveways and under your foundation. The Ant Extermination Experts at Eco Tech utilize an organic product line that is less toxic. Our exterminators are able to identify which species of ants are causing problems in your home or business. We use different techniques and treatments depending on type of ants. 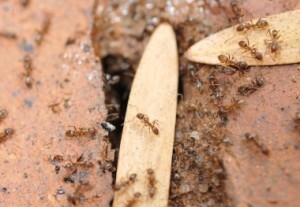 Locating the nest is important for ensuring the extermination of the entire ant colony. Eco Tech provides Professional Ant Extermination Services for Arden Hills, MN clients in need of assistance with ant problems. We offer safe and effective solutions with Organic, Less Toxic Ant Control treatments. Our experienced technicians work hard to protect your investment from the harmful effects of ants and other pests. Contact us for either Residential or Commercial properties.